In spite of the long wait for ski season to start, my son and I overslept. Hunter is conveniently located for us, so our extra Zs were not a big problem. We pulled into the parking lot just a couple of minutes after 9 AM. We were eager to get after it but I was kind of nervous too. 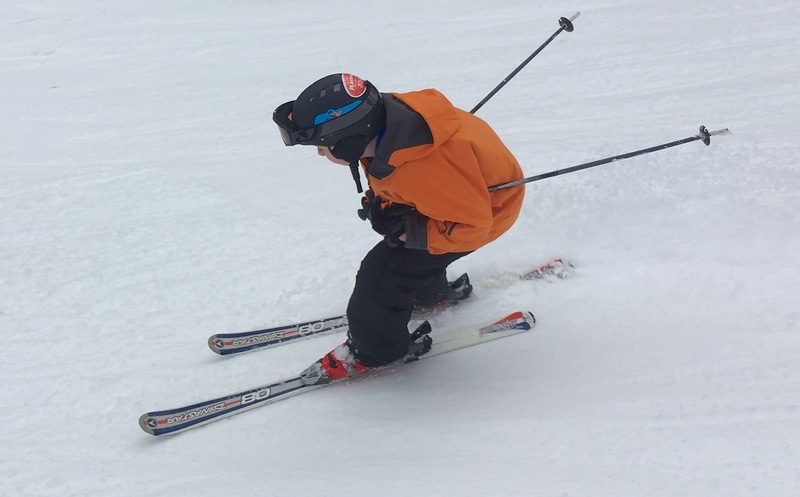 I’m on the record as fan of early season skiing but this would be junior’s first opening day experience. Would the traditional white-ribbon-of-death and the Hunter faithful overwhelm him? 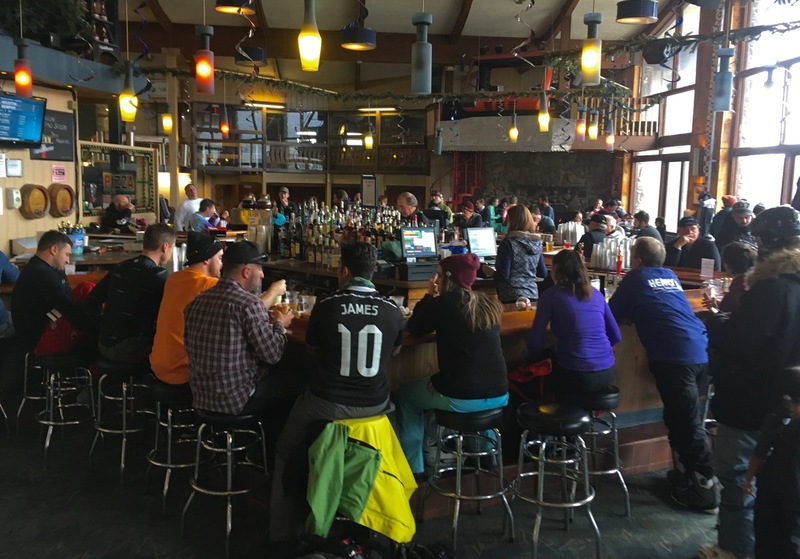 We booted up, schlepped our skis over to the racks and redeemed our Liftopia vouchers at the ticket window. 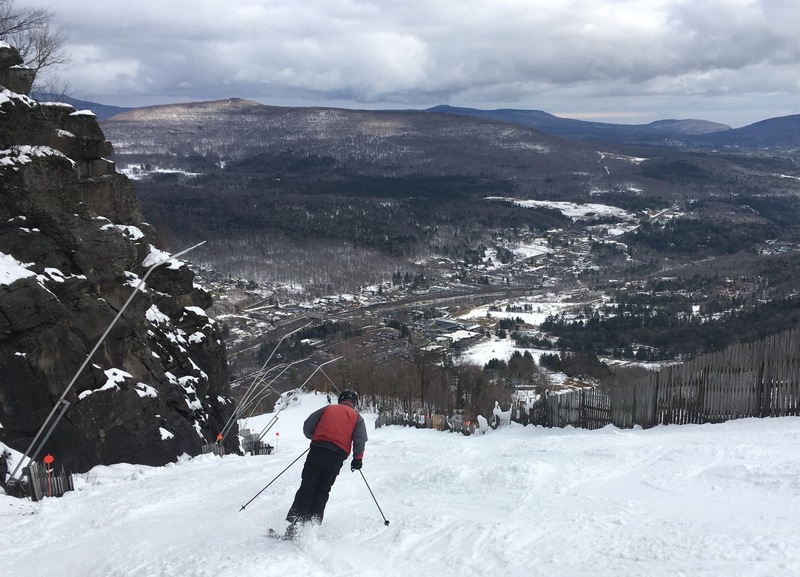 Hunter’s detachable six-pack, the Kaatskill Flyer, whisked us off to the top. 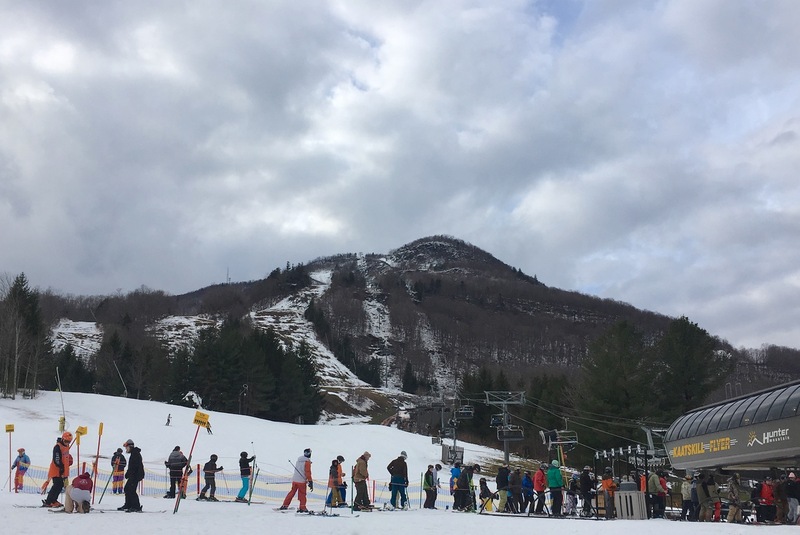 Hunter’s website advertised four lifts and eleven trails for opening day. Open terrain was wall-to-wall and the base was deep. We did two quick laps on The Flyer to get our legs back, skiing Hellgate down to the intermediate runs below. It felt great to be back on skis again. Temps were in the upper thirties and the snow was soft. Good confidence-building turns for junior and a little piece of mind for me. I spent a lot of the morning coaching my son on how to handle himself on limited, crowded terrain that typifies opening day. Skier’s often chose the same lines downhill, so I tried to get him to think about going the other way. He did great. Hunter has a huge fan base and it showed; you could feel the pent-up energy. It seemed that everyone had a big dopey smile on their face, myself included. After a couple runs on the Flyer we opted to slow it down a bit on the triple. It dropped us off a little lower on the mountain but for us it skiing right onto the lift was worth it. I didn’t want to push it too hard our first day out. Around lunchtime, the pressure on six pack dissipated. I left junior on the triple to ski Cliff, a trail that I thought might be a little too much for him on opening day. Like every else that was open, Cliff was wall-to-wall, a blast with a deep base. After a bit we met up for a late lunch, sitting outside to check out the scene. 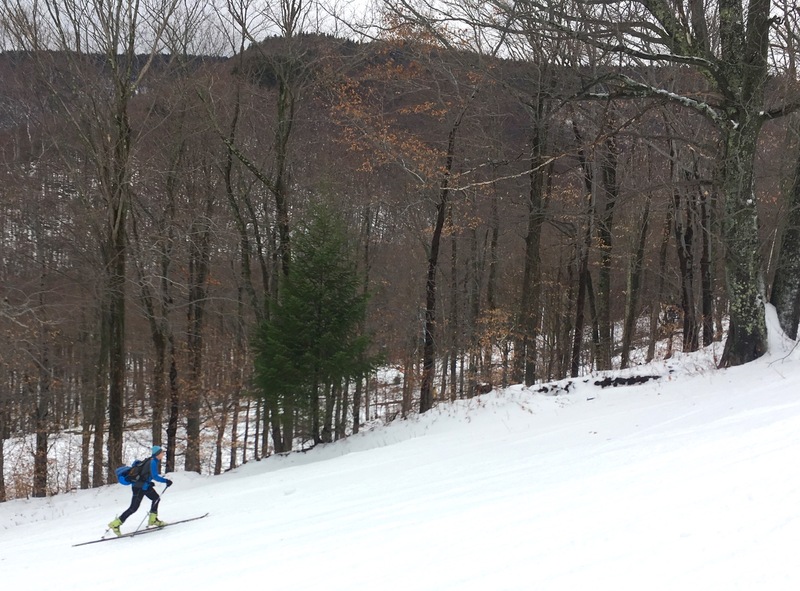 It was clear we weren’t the only ones eager for the Catskills ski season to get started. After lunch, we did a few more runs from the top but it was clear we weren’t ready to go the distance. Our legs were screaming for mercy; we took it easy and left a little early. If the rest of the season goes as well as opening day, we’re in for a great year. Fantastic! I was there with two friends on opening day (friday) And it was above and beyond my expectations. The snow was very carvable, and coverage was excellent. Very conveniently located for me too, and it was a great way to kick off the season. My love for skiing will always stay with me. At a time in my life that I no longer ski! I will never forget all the memories I have stored in my memory of all the ski resort of past. That’s a great post! Welcome back! Thanks for the comments, especially yours Gail. That really makes me feel good. Skiing has that ability to span generations. It’s one of the things I love about it. Good post and nice pictures! My son and I were there also and considering the weather, we both thought that the conditions were very good. Although it is not that convenient (we came from the Philly area), it was worth the drive and we enjoyed the great early season vibe. Looks like a great day to go skiing to me. Nice piece. Just a follow up regarding Hunter Mtn. Costco is now selling two unrestricted e-ticket vouchers on the Costco website. $99 for two and there are no black out dates. It is a great deal. Not many places you can ski for $50 a day at this point.